Ahhh! You guys! 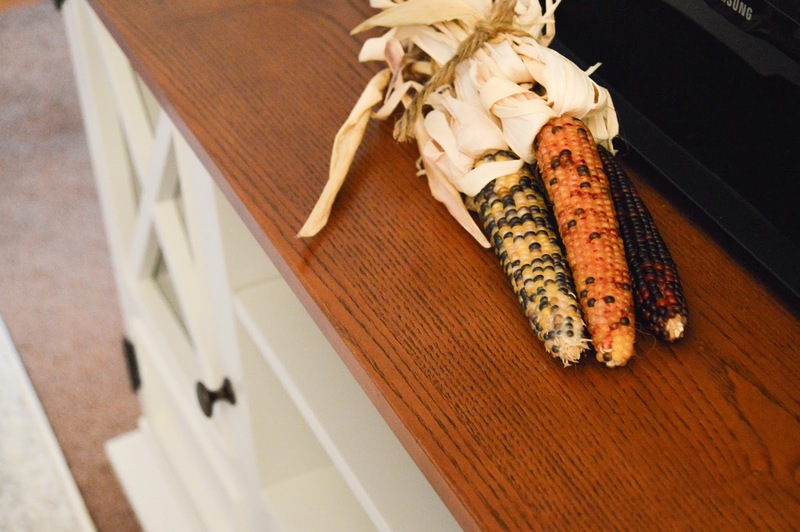 I'm so excited to show you a sneak peek of our living room! Though it's not finished yet, I am just so in love with our new TV stand and rug, so since I'm literally the worst at keeping secrets (I usually always end up telling my husband what I get him when I buy him gifts haha) I decided I have to show you all one side of the room! This TV stand is the Belham Living Hampton TV Stand from hayneedle! It's a beauty isn't it? I'm so in love with how it brightened the room up the way it did (our old TV stand was wood colored), and it's just the prettiest classic look! 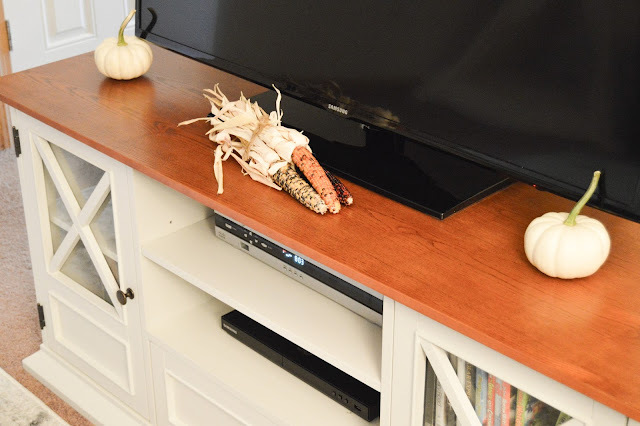 I'm planning on adding a magnolia wreath in the middle of the wall above it to make that side of the room pop even more and I can't wait to add some little pumpkins to the top and on the shelves! Maybe even some pine boughs at Christmastime! How darling would that be? 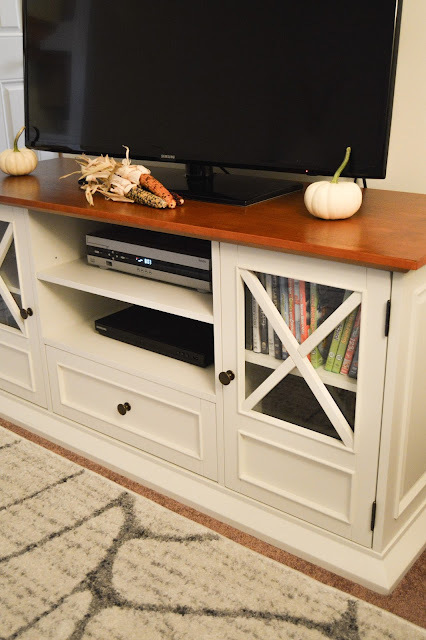 The Belham Living TV Stand was actually surprisingly easy to put together, it came in a huge box and my husband and I put it together one evening, which only took about an hour and a half! How great is that! All the pieces were there and everything was in perfect condition! And it arrived the day after it was shipped! Talk about some fast shipping! Thanks hayneedle! 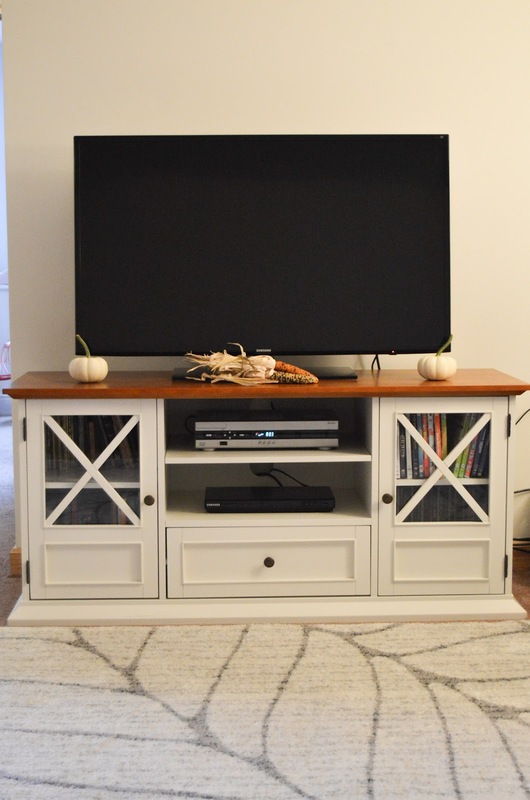 We are loving this new TV stand! 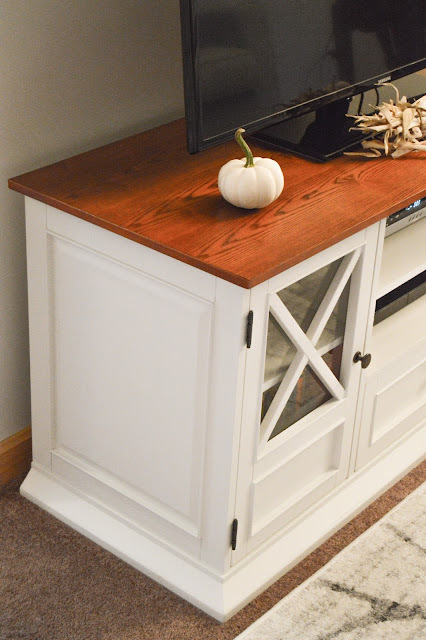 Even our 2 year old was excited about this TV stand from hayneedle! For 2 days, all she said was "I so excited about the new TV stand!". It was the most adorable thing, and she truly is the sweetest little girl. She even wanted to help us put it together so she had the job of holding a few small pieces for us temporarily while we gathered up the tools we needed (a screwdriver and hammer, a hex key was already included with the screws and bolts). 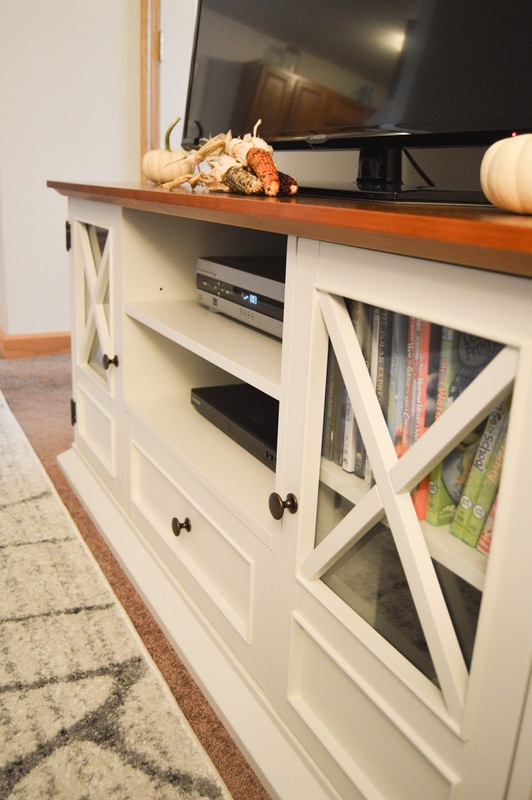 This TV stand was a family effort to put together and that makes it even that much more special to us! It's very well made and I feel like we will get a ton of use and a lot of years out of this gorgeous piece! 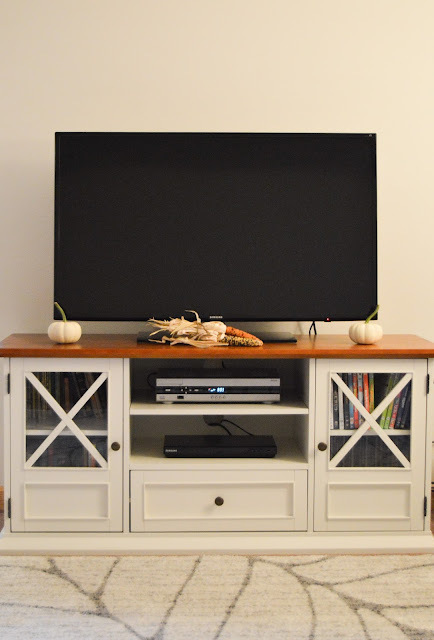 One super nice surprise was how much storage the Belham Living Hampton TV Stand from hayneedle actually had! Inside the side cabinets, I was able to stack our DVDs 3 rows deep! 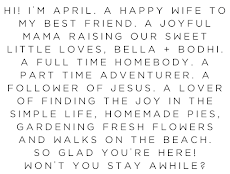 Talk about pleasantly surprised! Below that we have our CDs, and on the other side we keep all of our books! And let me tell you, we love books in our home, especially little Bella! I foresee a ton of new books joining our little book collection this Christmas! They're all covered by the most beautiful little cabinet doors with tempered glass and the prettiest "x" design. 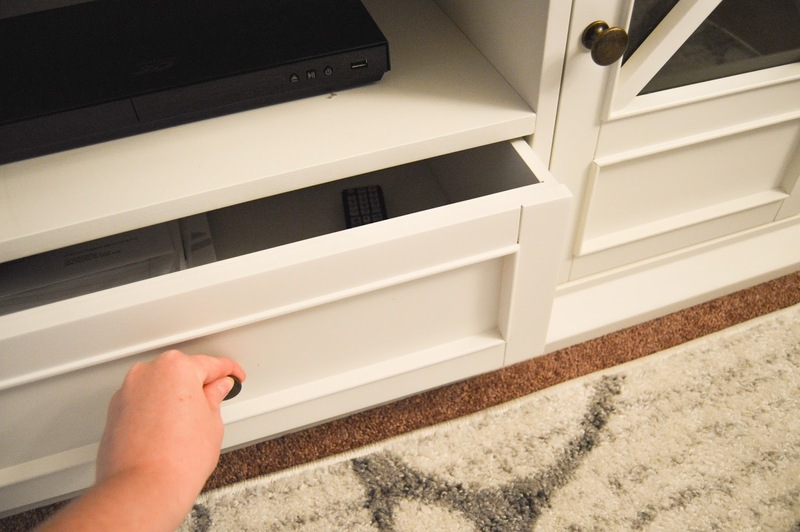 And the drawer underneath offers concealment for all those extra things you don't want sitting around; It's perfect for magazines and of course our remotes! 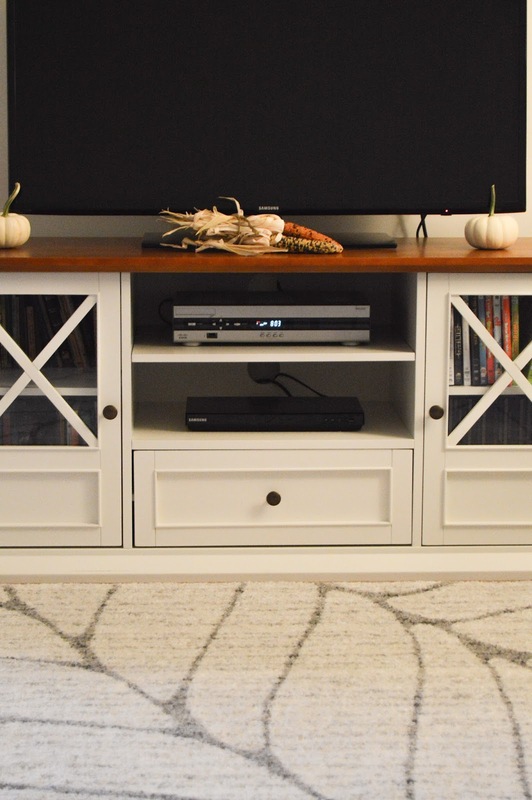 I also love the middle shelf, how well it houses our cable box and DVD player. 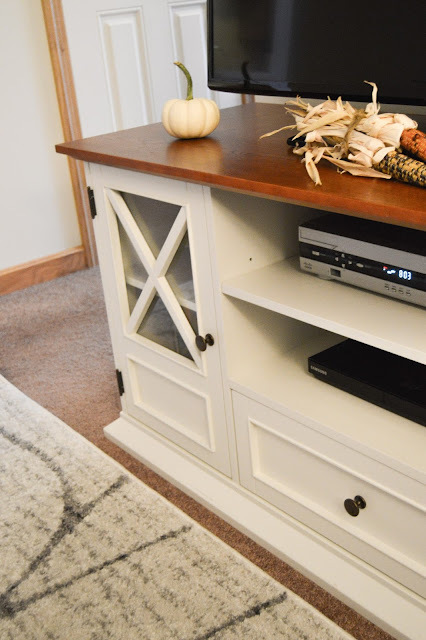 With our old TV stand we had to sit them on top of each other and the cable box would get overheated with the DVD player sitting on top of it, now, we have that problem no more! Yay! 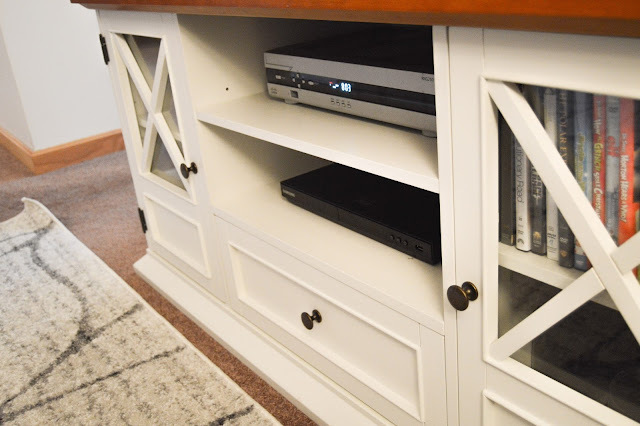 The whole color is just the best, a perfect shade of white, with classic lines and molding, and the top is genuine oak wood veneer! This TV stand is 55 inches long and 25 inches tall, the perfect length and height for what we needed! 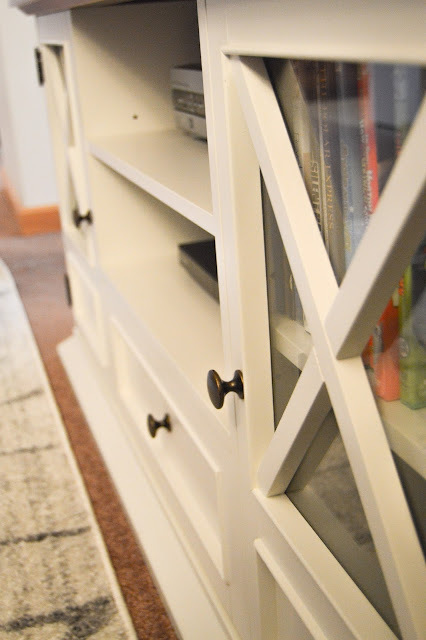 I should also mention that the shelves are adjustable, so you can make them higher or lower depending on your personal needs! And the antiqued metal drawer knobs add the nicest touch and contrast to all the white of the TV stand. I seriously couldn't ask for more great features and attention to detail in one piece of furniture! It's a sure conversation starter too, everyone always wants to know were we got it, and of course I tell them hayneedle! 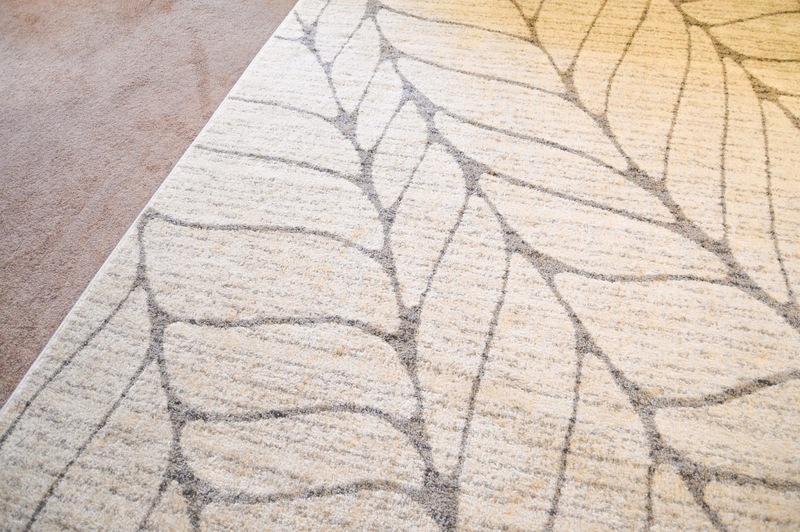 We also purchased a new rug from RugsUSA! We had a cream colored shag rug with a brown trellis design previously, but both myself and my hubby decided we needed a change, so we looked through the RugsUSA website and within 10 minutes had both agreed upon the exact same rug! Which if you know my hubby and I, you know that the last time we bought a rug we didn't exactly agree on which style to get haha (though we did choose eventually). 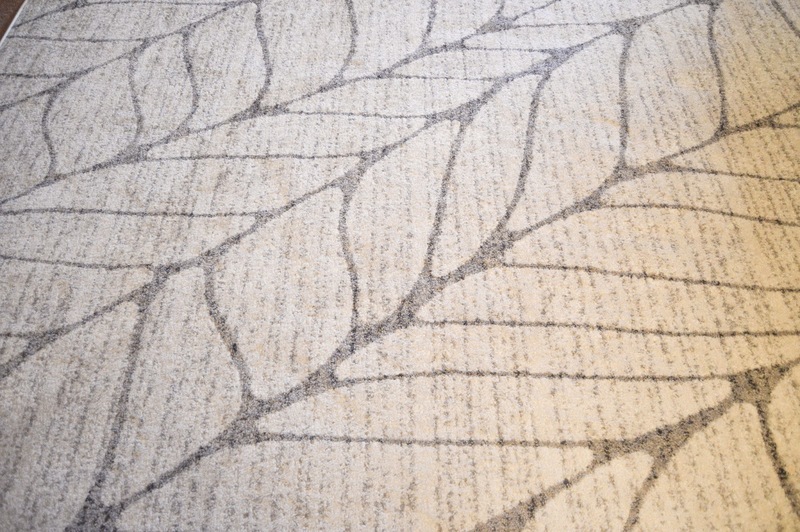 This rug is the prettiest addition to our home, and it's oh so easy to vacuum (the shag rug wasn't exactly the easiest to clean), and it's super soft on the toes! So double win! Plus is brightens up the room which is one of the biggest factors we love since there isn't much natural light in our loving room. What is your favorite feature about the Belham Living Hampton TV Stand from hayneedle?